With increased competition from Microsoft and Chinese Androids, Motorola has to stay on top of its game if it wants to remain popular in the entry-level segment. 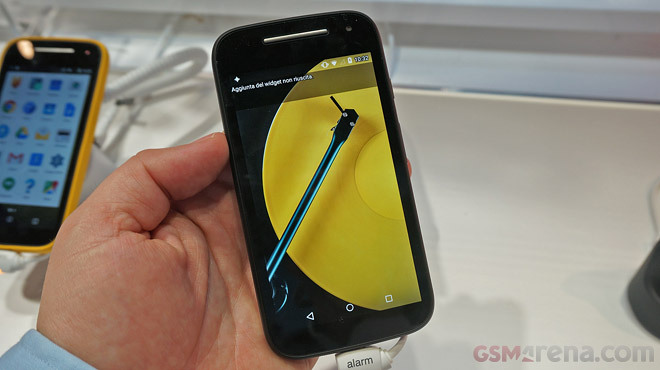 The Moto E (2015) maintains the same thickness at 12.3mm and practically, the same weight, 145g. The battery capacity has increased by about 400mAh and now stands at 2,390mAh. The extra juice goes to feed the slightly bigger display and the new, faster chipset. Speaking of the screen, it still has qHD resolution (540 x 960px), but now measures 4.5″ in diagonal (up from 4.3″). The drop in sharpness is not perceptible, but you gain about 10% of screen surface area. Better yet, it’s an IPS LCD with good viewing angles and Gorilla Glass protection. The bezels around the screen are on the chunky side and the screen quality isn’t amazing, but good for the price class. The chipset is a more difficult matter. If you get the Moto G (2015) LTE – yes, LTE is an entry-level feature now – you’ll get a Snapdragon 410 with a 64-bit Cortex-A53 1.2GHz with 1GB of RAM and Adreno 306. There will be a 3G version soon, which drops to Snapdragon 400 (32-bit Cortex-A7 + Adreno 302). Either way, both are better than the dual-core processor of the original. It goes without saying, but the Moto E (2015) comes with a pristine Android 5.0 Lollipop out of the box. The newly-found processing power enables 720p video capture from the 5MP camera. There’s even a VGA front-facing camera – not exactly a selfie machine, but better than nothing. The build quality of the Motorola Moto E (2015) is pretty good. There’s a strip of plastic running around the sides of the phone, Motorola calls these Bands. They come off easily so you can add a splash of color to the device. The bands cost $20 for a pack of three and the current options are Red, Blue & Yellow and Turquoise, Purple & Raspberry. The Moto E is available only in Black and White, but the Bands multiply your options and give you a taste of what’s possible through the Motomaker if you want to upgrade to one of the higher-end devices.